Grand live oaks, charming park. Minutes to downtown & the finest beaches in Florida. Amenities that today's RVer appreciates, pristine bathhouses, friendly staff, shuttle to trolley. The staff is beyond exceptional and accommodating. They went out of their way to help us with a problem with our motorhome and seemed like they were happy to help. They told us about St Augustine and how to get around. We will definitely stay here again in we are in this area. Great people! Very professionally managed. Helpful, friendly staff. Gated for security. Good roads and easy site access. Short term sites are a bit close but in and out of drive thru sites are staggered to provide privacy. Pet friendly and there are lots of dogs - fortunately well controlled. Simple to get into St. Augustine and back. Close to #95. One of the best! This was our very first RV trip in our new SunSeeker and I have to say it was a great one. I called this a research trip in checking everything out and finding out about RV Parks. I had read reviews so decided that a 2 hour drive to this park would be a good move. We were met at the gate by a guide. They had all our info and had a golf cart directing us to our site. We stayed in a 31 ft Class C Motor home and of course were a little concerning with parking it. We got a pull thru on site 15. It was on a corner which some might not like for privacy but we loved it. We have little does and hooked them up outside and they enjoyed it as well. The site was very level but we have auto leveling so of course we had to try them out. Water and sewer hooked up fine as well as electric. We camped here two night and wish we would have been here longer. Everyone was so friendly and they had planned activities so we got to meet fellow RV'ers. There was a campfire with s'mores which I loved (pet friendly) on one evening for free. Breakfast buffet for $5.00 a person on one weekend day. (bargain and good). And a band on Saturday evening free as well. They have bags and dog disposal cans throughout the park and lots of trees. There is a dollar store at the entrance (walking) that has more items than I have ever seen at a Dollar store before. Being our first trip, we took advantage of a few things we found we needed. Gas station was close as well and the park has Propane fills. I wasn't that great of a planner for food and we ordered Uber Eats which delivered to the entrance one evening. We will definitely be back even though it is just a couple hours away from our place. Many northerners there for month visits and they all seemed to know each other. Upon arrival, someone from the office came out to our MH, gave us our information through the window and escorted us to our site. Great PR and very nice management. Some of the sites in one area are a little crowded but our site was very nice, level and plenty of shade from the Florida sun. We walked over to the pool and were quite impressed. Pool was very inviting and the lounge chairs very comfortable. We walked all around the park and the back area is extremely nice with very wide sites. We definitely plan to stay there again on our way back north from Florida. Easy entrance and exit for our 40' MH with tow. Nice park. The old section has lots of shade for most sites. The new section is beautiful with paved sites and wide spaces, but little shade. The only issues I had was that one restroom facility was closed for the duration. Another close facility had only two showers, often lacked hot water, and once the heater was not working. But good location between I-95 and close to St. Augustine. I would definitely stay here again. I loved this campground, nice people, quite setting, close to attractions yet hidden away. Will definitely come back. Staff was very welcoming and courteous and the park was large and well populated. Good hookup at my site, and enough room to relax outside the RV. Socials including Saturday breakfast and Ice Cream social were provided. Cable provided but not many sites had clear view for DTV or DISH. Antenna also very good. Clean laundry and restroom facilities and convenient to shops and not far from downtown. HUGE dog park with poop bags provided. This was our first trip in our RV. The staff gave us the best customer service and feeling of welcome. The facilities were clean. The bathhouse near us was always clean and cool. The wifi was very good and the cable was ok too. Our dogs loved the dog park onsite and loved being just a few minutes drive away from St Augustine Beach. Also very close by were restaurants, grocery and shopping. The folks at Compass RV park are doing great things with their park with a super staff and many improvements in progress. Can't wait until our next opportunity to visit! This is a very nice campground. The staff were extremely friendly and helpful. When we pulled in we were greeted right at our motorhome and we were checked in without leaving our coach which was very nice. It is a gated park. We were escorted to our site. Sites were level and a nice size. We had a pull through for our big rig and we had plenty of room. There was a nice concrete patio and picnic table. Utilities were good. WiFi was very good and fast. It appears the new owners are putting a lot of effort into making this a nice place. They are currently adding a whole new section to the park. Nice quiet place and highly recommend. Thank you for taking the time to write this kind review. We are pleased you had a positive experience at our park. Wonderful, quiet, well maintained RV Park. Folks running the park are very friendly and helpful. Close to everything in St. Augustine. Highly recommended RV park. Thank you for taking the time to write this review. I have shared your kind words with the team. We stayed 3 weeks in December and thoroughly enjoyed our stay. This is a very nice park that gets better every day. New owners are making continuous improvements. Sites are level and spacious. Satellite is spotty due many beautiful trees, but cable is very good. Facilities are very nice and impeccably maintained. The owners and staff couldn't be more friendly and helpful, and the weekend entertainment is an added pleasure. This is the perfect place to stay while enjoying beautiful Saint Augustine. We will return every chance we get. While undergoing upgrades, this is a really nice park. Gravel sites but no mud or standing water and most have new concrete pads. Gated so it is secure and extremely convenient to everything. Trolley has shuttle that picks you up for your adventures in St. Augustine for a very reasonable price. Shopping close by and convenient to interstate. Their reservation site sets the standard that every park should strive for. NICE! From Tennessee headed to Key West for the winter but plan to stay all next December right here. We appreciate the time you took to write this very kind and detailed review. We look forward to your return visit...until then have a safe journey! Stayed over Thanksgiving weekend 2016 (site 12) with two other RVer's (sites 13, 16) we vacationed with at St Augustine. Only two open suggestions: 1) place road signage within the park to assist those with where sites and facilties are located and directions to the exit 2) clear vegetation from within the pet park along the fence ...... Even with these, the park was ideally located within an easy drive to St Augustine. The sites were in working order, spacing was good, the facilities were extremely clean and well maintained, and the staff was very friendly and helpful. We look forward to visiting again and seeing the further improvements and expansion planned. Great job on a busy weekend! Thank you for your review and your suggestions. The team has worked on the pet park and we are pleased with the results. We appreciate honest feedback from guests like you so that we can be better and benefit from the campers perspective. This was a pleasant surprise find for us. Easy to get to. Camped during Memorial Day weekend. We had a backin, gravel site. We were close to the bathhouse, camp stage, lake.... Fantastic staff! The new owners and managers have worked very hard to make this a "pet friendly", "family friendly" park and a wonderful place to relax and enjoy! New laundry facilities, pet playground, catch and release fishing, and Live music over the weekend by Wayne and the band "Moondance" were just some of the great features. What a treat for us. Can't wait to come back! We are so pleased you enjoyed your stay and we hope you do come back again. 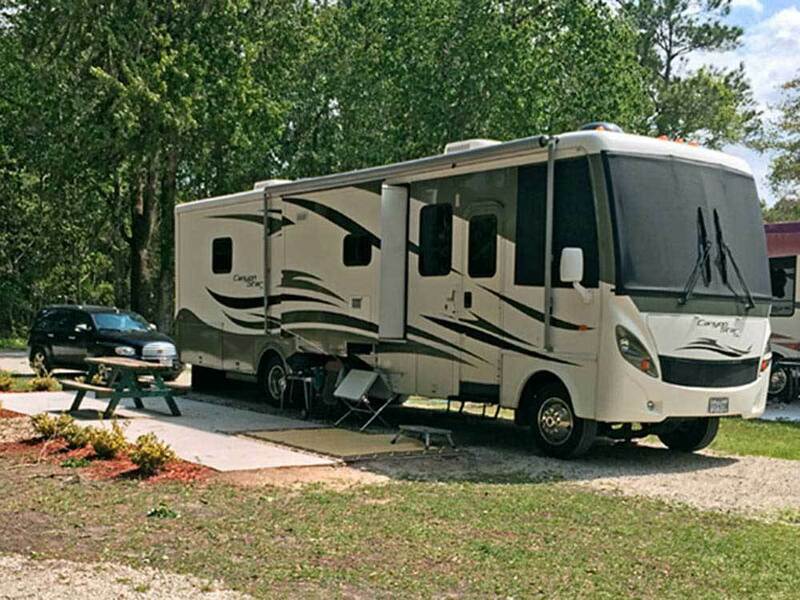 New owners have made great strides to improve RV park. Many sites have new concrete patio and landscaping, more to come. One of the best online reservation systems I've used. Outstanding wifi with towers throughout park. 250 mb download pre day free, with option to purchase fast enough wifi to stream at $16 week. Saterday campfire with live music was an unexpected bonus. I paid $42 per nite for pull thru, not bad for high tourist environment. Thank you for taking the time to write this gracious review. Please visit us again if your journey brings you back to the St Augustine area. This is a great park. Only a short drive to the major attractions; clean restrooms and showers, entertainment and a group campfire on the weekends. Sites are level and all but two have full hookups. Well run by a friendly staff. Could use a playground for the youngsters. Will stay there again. Thanks, we appreciate these kinds words. Thank you for taking the time to write this great review! Nice convenient park with lots of big trees, spacious dirt campsites and quiet. Wasn't able to use sat due trees but have lots of air channels and cable. Easy in and out with my 45 ft coach and toad. Sandy campsite not much problem due it's dry right now but probably not fun when wet. I thought the $55 camp fee for plain Jane 70ft site was excessive but all St Augustine campgrounds are pretty expensive. Did not review baths due not used. Only stayed over night. This camp is under new ownership, very friendly. Used to be Indian River.